Yesterday, MBDA National Director Alejandra Castillo concluded her week-long tour of California where she spoke to local businesses and community leaders about the Obama Administration’s work to spur continued economic growth and job creation through support of exporters, entrepreneurs, and small, women- and minority-owned businesses. Earlier this week, Castillo joined U.S. Secretary of Commerce Penny Pritzker in Oakland where the Secretary delivered remarks highlighting a number of Commerce Department resources available to help foster economic growth among minority-owned businesses. The Secretary also discussed the Commerce Department’s “Open for Business Agenda,” a bold policy agenda focused on boosting trade and investment, supporting innovation and entrepreneurship, and unleashing more government data. Following the Secretary’s remarks in Oakland, Castillo led a panel discussion on economic development that helped to connect local business leaders and economic development organizations with the expertise of the Department and its resources. The forum featured Overseas Private Investment Corporation’s (OPIC) Director of Corporate Development, Alison Germak; Port of Oakland’s Director of Aviation, Deborah Ale Flint; Alameda County Supervisor Keith Carson and Oakland Mayor Jean Quan. Yesterday, Castillo addressed an audience of more than 3,000 minority business owners, corporate representatives and community leaders at the California Hispanic Chamber of Commerce’s (CHCC) Latinas Hall of Fame Luncheon. The luncheon was part of the CHCC’s annual convention that focuses on the latest business trends and economic impact made by Latino businesses. It also provides the MBEs with resources for growing their businesses and adapting to changes in the market. 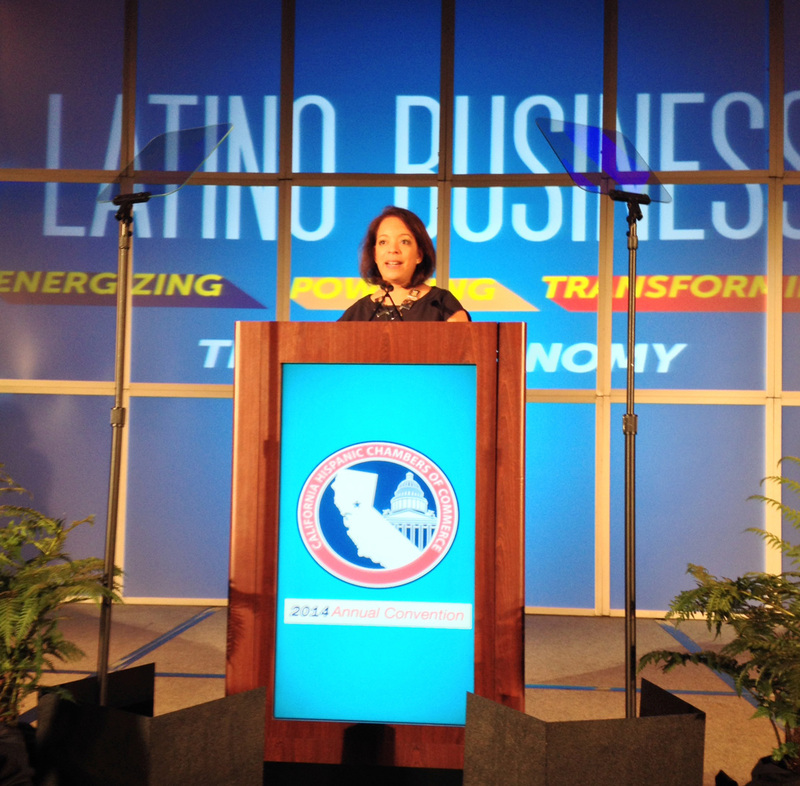 During the luncheon, Castillo delivered remarks highlighting the tremendous growth of Latina-owned firms over the last 16 years. She noted that California is home to nearly 600 thousand Hispanic-owned firms that reported $80 billion in gross receipts while employing nearly half a million Americans. California Latinas own more than one-third of Hispanic-owned firms, generating over $13 billion in gross receipts and employing 70 thousand U.S. citizens. Castillo also discussed the business tools and resources of MBDA – including the Agency’s five business centers in California located in Fresno, Los Angeles, Riverside, San Francisco and San Jose. Following her keynote address, Castillo joined a panel discussion titled An Afternoon Conversation: Latinas Redefining Power. Among other discussion topics, the panelists shared their own successes and visions for the future of Latina entrepreneurship.